Until a few weeks ago, I only thought of radishes as the spicy crunch in my salads. Or in pickled form. Which I have to admit, are one of my least favorite types of pickles, just a bit higher ranked than eggs. But all that changed while flipping through the Edible Brooklyn cookbook, a gift from a few Christmases ago, far under utilized. A recipe for radishes sautéed with cream and herbs caught my eye. I had heard of cooked radishes but never sampled or made them myself. The promise that cooking mellowed the root, taking away it’s spicy bite was a bit disappointed (there’s just something addictive about the peppery snap of a radish) but I was still intrigued. I was hosting dinner for my husband’s family and other than a few dietary restrictions (gluten and pork free), I knew some creative license would be appreciated. In early may, other than asparagus, local produce still mainly accounts for the end of last years root vegetables and some early greens. I was thrilled to spy the first radishes of the season that morning while shopping at the Grand Army Plaza greenmarket. My menu was already completely planned, but adding some extra veggies never hurt anyone. It was a sign. I was destined to cook radishes that night. I found the original recipe’s use of herbs a bit excessive. Or maybe I was just lucky to come across monster bunches of scallions and chives. Using a full bunch of each as directed would have meant a salad of greens with a few radishes to dot the dish. That just wouldn’t do. I was impressed by how rich the dish seemed with only a few drops of cream. The dish was perfectly balanced. No crunch, but still tender and peppery, thanks to some extra seasoning. Heat butter and olive oil in a large sauté pan over high heat until shimmering. Add garlic scapes or green garlic and cook until softened, 2-3 minutes. Add radishes and cook another 2-3 minutes until they begin to brown. Add stock, reduce heat and simmer until radishes are tender and most of the liquid has evaporated. Add cream, increase heat to high, and cook until cream slightly thickens and clings to radishes, about 1 minute. Remove from heat, season with salt and pepper and toss with chives and scallions. Serve immediately and enjoy plentifully (this is not a recipe that keeps well as leftovers). This was delicious when you made it! I bought some radishes at the market this weekend (and they have quite a spicy kick to them! ), perhaps I’ll make it this week. I’m not positive I’ll be able to find garlic scapes though – so what is green garlic? Is there another substitution I can make? Green garlic is basically baby garlic. I’m not sure it’s still available, but it kind of looks like spring onions. You can also just sub for minced garlic. I have yet to find garlic scapes at the markets yet, but did get some from the coop yesterday (grown in Lancaster, PA) so they should be showing up everywhere soon! 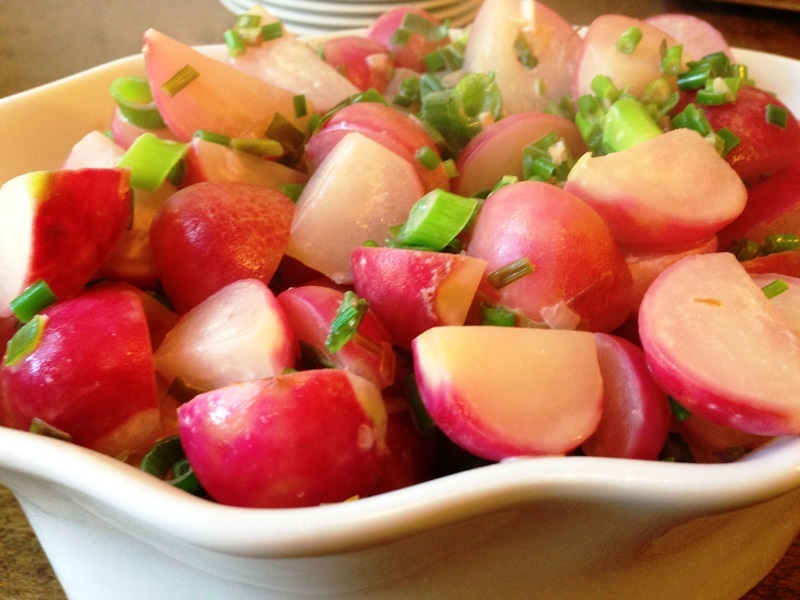 I really like cooked radishes, this is a really nice recipe and I’m sure it was a hit at the dinner. I’m totally in love. What other ways have you prepared them cooked? Oooh I have never cooked radishes I always like to enjoy them raw. But you know this sounds completely tasty nice post! Thanks! I highly recommend trying the recipe. It’s a bit confusing at first bite. You’re expecting something that they’re not. They taste like radishes, but at the same time don’t. But either way delicious! I was stuck on what to make with my CSA’s radishes, but this sounds like a great dish. Thanks! You’re most welcome. I’m so jealous everyone’s starting their CSAs. I still have another 2 weeks! I’m at Flatbush Farm Share, what about you? Park Slope. They “officially” start next week, but I’m an even week Thursday share, so I’m at the end of the start.